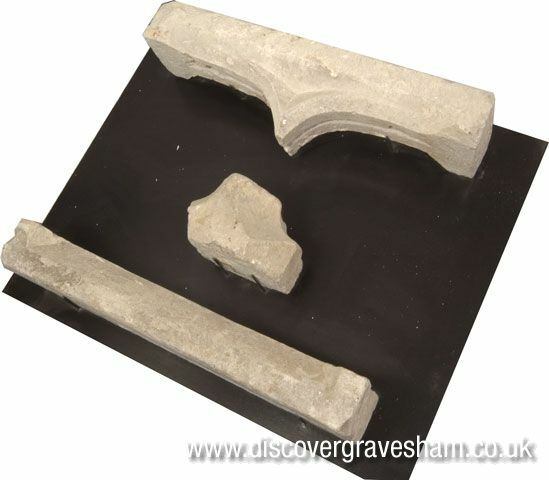 These fragments of moulded stone were found reused as rubble in the wall tops when major conservation work was undertaken on the Chantry. They are all pieces of limestone probably from the quarries at Reigate, and were dressed by stone masons to form different parts of a window. The window is of a design which is typical of a fourteenth century date, although it doesn't seem to fit in any of the window openings of the surviving building. They are from a plate tracery window which was designed to take glass. One of the stones has a small cross cut into its surface. This is either the mark of the mason, or possibly a mark to help the laying out of the window. Several of the stones show signs of alterations, and it seems likely that the fourteenth century window was altered to make a casement window, before being removed when the building was modernised.